We “Every Things Indian” are a prominent entity engaged in manufacturing and exporting a wide and trendy range of Harem Pants, Ladies Designer Blouse, Designer Shawls, Embroidered Dupatta, Embroidered Ladies Shorts, Ladies Koti, etc. Established in the year 2014 at Vadodara (Gujarat, India), we are a Sole Proprietorship firm, engaged in offering a quality-assured range of products. Our Proprietor “Mr. Sunny Limbachiya” has immense experience and under his worthy guidance, we have achieved a respectable position in this domain. Welcome to Everything’s Indian. We are leading Indian handicrafts manufacturers, supplier. We come with a wide array of highly beautiful handicrafts in India made by highly skilled and professional team of artisans. Our craftsman expert in crafting structures using several material. 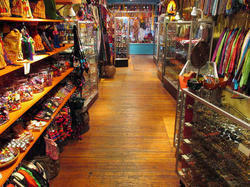 True to its name, our shop will take you towards the tradition of India. We always believe that “Tradition and Culture should be followed by everyone”. We house a top notch and strong infrastructure set up for fabricating these products. Besides, our unit is well connected with shipment modes that enable us to timely delivery of our curtains and jewelry at the customer's end. In addition to this, our set up has a large warehouse to store products and though meets the needs of the customers. We have recruited well-qualified professionals in our team. The team members puts its hard efforts in all the business operations. To maintain stress-free and conducive environment within the premises, the team works in close coordination. The professionals in our organization have in-depth knowledge and are well-versed with all the facets of the industry. Furthermore, they work with utmost dedication to meet the organizational targets.